Hello, My name is Cat and I have a problem with anxiety in social situations. To put it simply, I have fears and problems when it comes to making friends, maintaining friendships and all aspects of a social setting. It's a problem I've lived with most of my life and I'm here today to finally talk out loud about it. Tell you why I have it, and what I do to overcome it! Admitting that this is a problem publicly is hard for me, because I'm already feeling slight anxiety about publishing it. I feel like I might accidentally offend any friends reading my blog, but I planned to write this post in order to help anyone with similar issues. And I'm doing all this because it's not nice feeling like a socially awkward mess, when actually you're a really nice person and you probably just need help with your confidence and being yourself! I, personally am still not 100% confident about being a social butterfly, but I'm hoping this post can help the both of us or anyone who knows someone who might be struggling with the same problem. I was always keen to have lovely friends, and in all my years I've always tried my best to be a wonderful friend. But somehow I've always been metaphorically kicked to the kerb. Ever since primary school I have gone through my fair share of falsified BFFs but I was always replaced by a better and/or real BFF. I wasn't ever "best friend" material for anyone it seemed, so I've never experienced having that friend you've been through it all with like most have and feel like I am missing. The general friends thing soon became a problem too as I started to see the issue repeat itself with that. Trust issues and worries about it happening again led me to try ever harder and that seemed to make it worse. I was always wondering what people thought of me. Did they really like me? Did they see me as part of the group? Was I considered in weekend plans or gossiped about? All these things and more going through my mind causing me to panic and then bring my guard up. And I was kinda right to put it up, because unfortunately I was right to. No one really saw the real me because I was trying so hard to be what I thought these friends wanted me to be. In the present day I worry about it a little less about it because I'm not in a social situation as often which is a little sad because it's my own fault. It still bothers me a lot when it does come up although. For example at a party, or a social gathering of any sort. I go into some sort of stressful panic mode. What do I do? What's it going to be like? What if I make a fool of myself? Yep - all the usual questions and I don't get why it still happens. I am a lot more confident as a person thanks to blogging, I have a lot more to talk about these days and I am an adult for god's sake! It feels so immature to feel this way, but it seems to be a problem I can't overcome. I'm actually a loud and confident person though. I could easily strike up a conversation with a stranger if the situation came up. Probably because I don't feel the need to impress them or build a good reputation or relationship with them. It's hypocritical of me really, but it's awfully true and I should use this information to help me overcome my problem! So if you've ever met me at a blogging event or meet up and I've ever been somewhat awkward and you've wondered why. It's probably because all this is running through my head! But I've always been better and more comfortable at blogging events. Usually because you probably already know what I'm like from my blog or social media. And if we've spoken before on Twitter or via blogs and we've hit it off, I'm probably going to be quite excited to meet you because we're getting on! I've absolutely loved it when I've found an internet friend at an event and we've both got uber excited about it! It's the loveliest feeling! And you've probably made my day with that ♥ I'm more myself online too, so you're more likely to get the real me bopping along smiling away because I'm going to be less socially awkward than usual and happy about it. 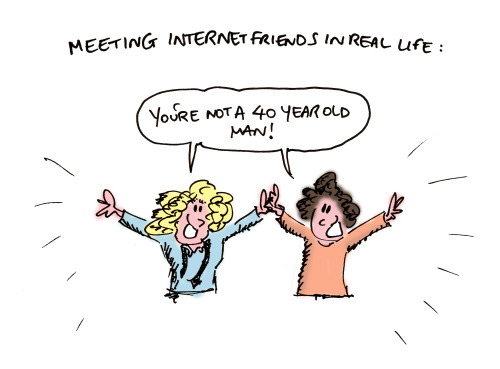 Though meeting new people at a blogging event seems to stump me... I'm sorry if I've been weird and we've met at a blogging event. This will explain it I hope! So how do I know if I'm suffering from social anxiety? I can feel it physically sometimes and it's quite mentally draining. Mentally, I ask myself a hundred and twenty questions in one go, I often picture scenarios I wouldn't want to happen and worry constantly about anything and everything from what could go wrong, to what people think of me. After a social situation, it can start up again with worries of what may have happened and what people think of me again. It's a vicious cycle. Physically it can feel like an ache in my chest, and often a raised heart rate and quicker breathing. I could get really hot, flare up into a cold sweat or start shaking and fidgeting. It all depends on where I am and when it is happening (eg. before/after/during a social situation). It's really hard to deal with when you're losing control over your thoughts and your body is reacting that way. In terms of overcoming my social anxiety, there's a couple of things I do to help me or that you could use to help a friend with a similar issue: ♣ I talk to someone about it. I talk about things with my only BFF, my boyfriend! It's not often I refer to the boyfriend as my best friend, but he truly is! he has the qualities of a best friend and he always helps me when I'm feeling like this. If not, I know I can always talk to a family member for reassurance. ♣ I put myself in the situation so I have to deal with it. Most of the time I learn that it's not as bad as it seems and I know I'm learning how to deal with it to make it easier next time! ♣ If I'm having a moment, I like to go outside or find a quiet spot and take some time to relax and calm myself. Sometimes it's too much all at once, so it's good to run off for a little bit and recollect yourself. Tip: the bathrooms a great place, and a great excuse! ♣ I remember to be myself. If they don't like me for who I am - then they're not a friend or worth my time. This is a hard one and takes time, but it's the truth. And that's the hard bit to deal with. ♣ If you're a friend, be one! There's nothing better than being reassured, even if it's just with a conversation or some company. It's best to say nothing about what you know might be happening in your friend's head or how they might be feeling. They probably know that you know and are happy and appreciative of what you're doing to make them feel comfortable and happier. Make sense? You've put into words exactly how I feel. I know I'm not best friend material and honestly I'm okay with that. I've cut toxic people out of my life and although I'm 100% happier they knocked my confidence a lot!! I can relate to this so well! For me, once I find the friend and get really close to them, I'm really good at maintaining the friendship. Finding the friends is the hard part, for me. Last year was the first time anxiety showed up in my life and it was so scary. I love blogging too - I may have said this already on a comment on your blog (LOL), but I stopped blogging for a bit, and then came back to it last year. I realized that my blog is the only place I can feel 100% comfortable sharing whatever is on my mind. It's my happy place to come back to be and myself after a day of classes or activities. I love it. Thanks for sharing!